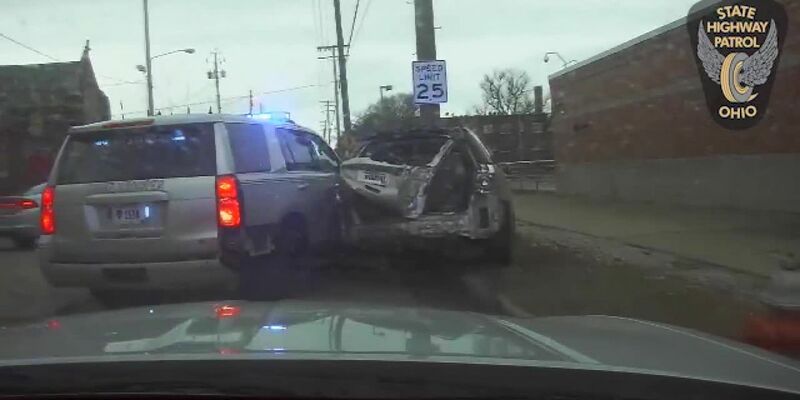 CLEVELAND, OH (WOIO) - A high-speed chase that reached 100-plus miles per hour came to a crashing halt in Cleveland on March 22. The pursuit began on I-77 north near Wallings Road when Imani Edwards refused to pull over for Ohio trooper, who suspected the window tint on her SUV was too dark. Newburgh Heights officers assisted in the death-defying chase that unfolded during rush hour on Friday evening. At one point, Edwards rammed police cruisers and nearly ran into officers who were attempting to pull her out of her car. Police smashed into her SUV on two separate occasions; the second hit came at East 105th Street and Marlowe where they finally arrested her. By the time the chase was over, Edwards’s SUV was a crumpled mess. Edwards was charged with felonious assault and failure to comply (a third-degree felony). Police report that Edwards had no outstanding warrants, which has sparked questions over why she failed to pull over in the first place.